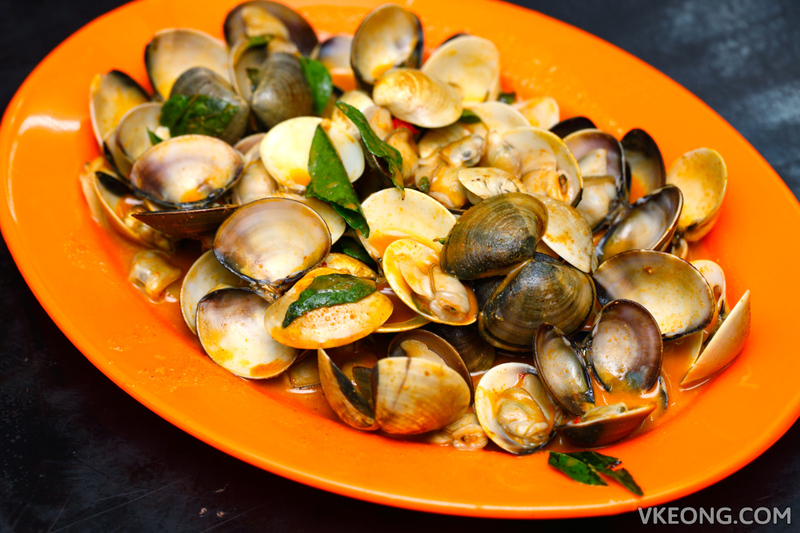 Chiak Song (吃爽) is a seafood restaurant in Batu Berendam that serves primarily shellfish dishes, kind of like what you would get at longkang siham. But they don’t just boil the seafood, they actually cook then with some of their homemade sauces. So the variety you get is better, albeit not by a lot. We came here during the Hari Raya Haji long weekend, so there was an unusually large crowd and cockles were already sold out when we reached. Luckily everything else was still available. The Sesame Oil Prawns @ RM25 was simply like what the name suggests – boiled prawns sesame oil and sesame seeds. For the price paid, we were expecting at least sea prawns instead of farmed ones. Although the prawns were fresh, they tasted just alright and the shells were a pain to to remove because they were sticking to the flesh. If given a choice I would skip this. Curry Butter Fried Lala @ RM12 – the fusion of curry and butter milk which worked wonderfully well. The sauce was wonderfully rich and spicy, highly recommended. Sambal Lala @ RM12 – pungent, not too oily, aromatic and no-kidding spicy. 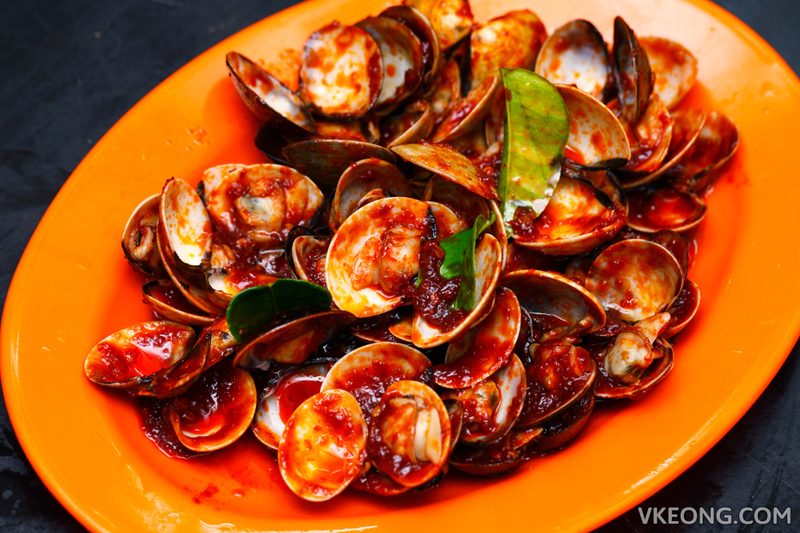 This was one of the best versions of sambal we have tasted and would pair well with other seafood, especially fish. Their signature Lala Bihun @ RM8 was said to be a must try, so we ordered it. 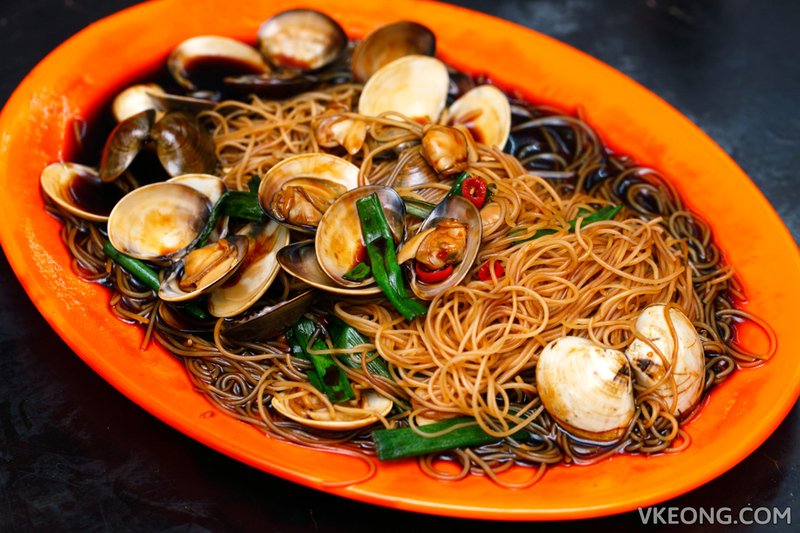 Sadly, it was a let down, as the noodle felt rather flavorless and all we could taste was the heat from the cili padi. 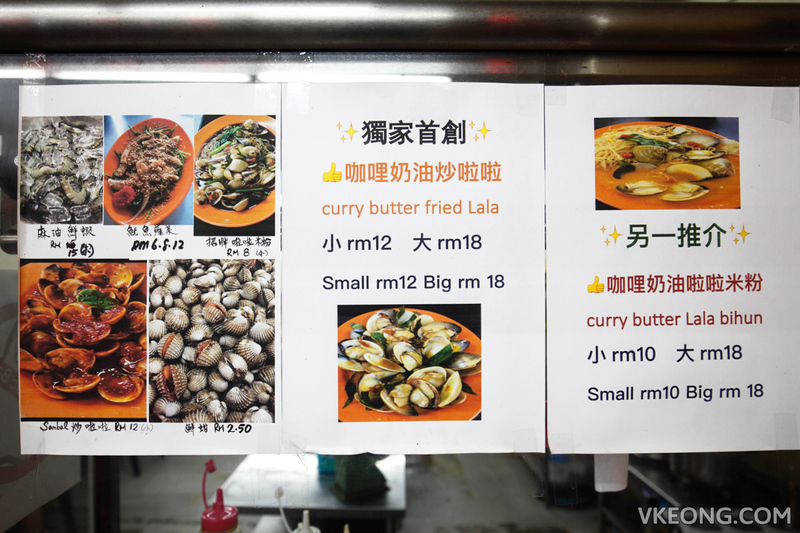 The curry butter lala bihun might have been a better alternative. 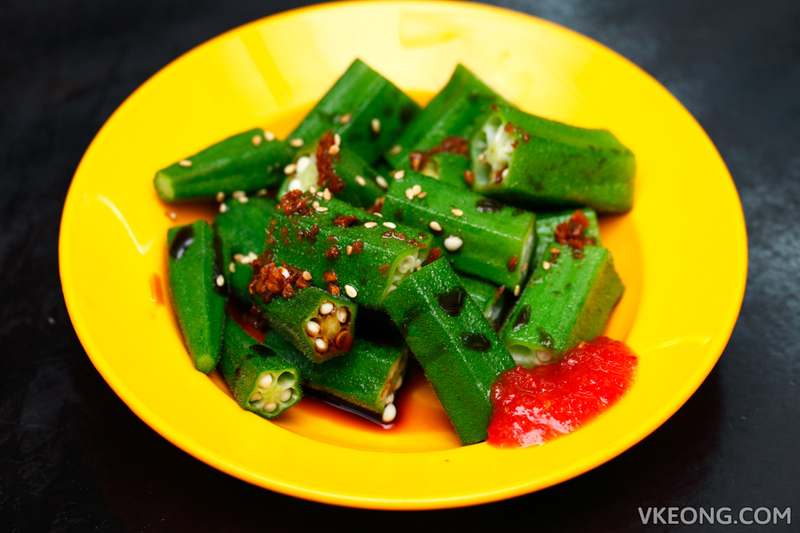 As simple as it looks, the Steamed Okra @ RM2.50 was surprisingly delicious thanks to the unassuming chili sauce which packed a punch of flavor. 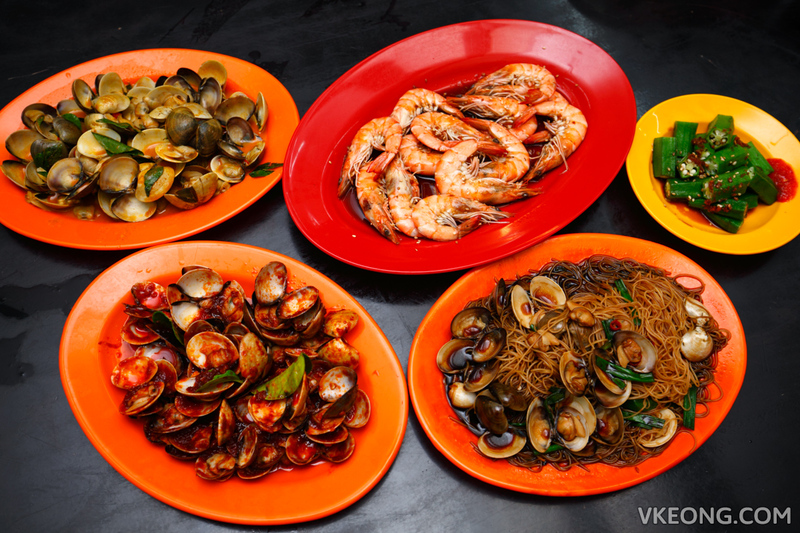 Besides seafood Chiak Song also serves a couple of side dishes like sotong kangkung, BBQ香脆五香 (a mixture of barbecued fish balls and fried bean curd) and desserts. The BBQ香脆五香 is highly popular item and almost every table had a serving. Since we were seated outside, we were able to watch how it was prepared, and we had plenty of time to observe the process because we waited more than an hour for the food to arrive. The lady (a foreign worker, you can see her in the pic above) who was barbecuing the food constantly blew into the grill to kill the flames. Saliva was flying everywhere so that pretty much killed any interest we had in trying it. Despite a few misses, I would still recommend you to come and try their lala dishes. And like I mentioned earlier, expect the waiting time to be painfully long if you are here during the holidays, as they seem to be unable to handle busy nights. 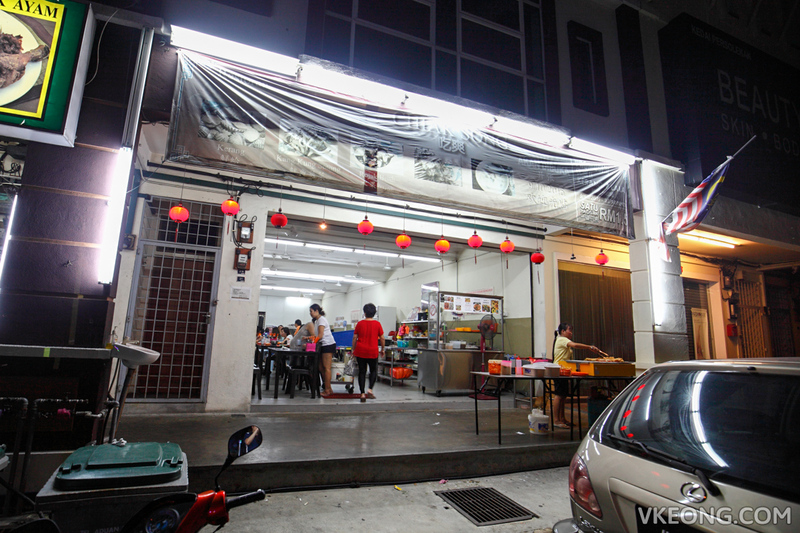 The post Chiak Song 吃爽 @ Batu Berendam, Melaka appeared first on Malaysia Food & Travel Blog.